Who qualifies for the DBN loan? All MSMEs (start up or existing) involved in productive enterprises are eligible for the loan. However, they must be customers of eligible financial institutions. DBN loan repayment tenure is flexible (up to 10 years with a moratorium period of up to 18 months) and the interest rates are on a market-conforming and fully financially sustainable basis. 1. Visit your bank: Commercial Bank, Microfinance Bank, Development Finance Institution (DFI) and other Financial Institutions and indicate you want to apply for a DBN Loan. 2. 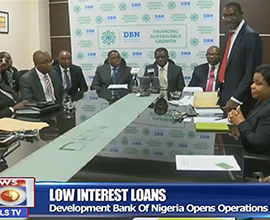 The Bank appraises the business and loan purpose, and if its assessment is favourable, the Bank applies to DBN for funding. 3. If DBN approves the loan, DBN will disburse to the Bank for on-lending to end borrowers.